So just remember what I had to go through watching this so you don't have to. Ultimate Spider-Man is, well, Ultimate Spider-Man. It's yet another animated permutation of the popular web-slinger airing on Disney XD as part of the "Marvel Universe" (not literally the Marvel Universe, just the name of the programming block - so for those of you worried about this being incorporated into the larger Marvel canon, you can breathe a sigh of relief). Drake Bell (famous for Nickelodeon's Drake & Josh and picking up MC Hammer's financial habits) cracks wise, throws webbing at bad guy's faces, and that's pretty much the show in a nutshell. It's a superhero cartoon series on a Disney network so of course it's going to be at least a little dumbed down, with apparent mixed results from fans depending on who you ask. As for Jessie, it's yet another multi-cam "KidCom" hanging on from the star factory era of Disney Channel's zenith. Starring Debby Ryan (of Disney's own Suite Life on Deck fame), it follows the eponymous character's life as a babysitter for the four rich and largely adopted children of a famous actor couple who since the second season have been almost completely absent from the show. And like many of its predecessors (namely Wizards of Waverly Place and Good Luck Charlie), Jessie can carry its own surprising weight in charm through its unexpected human storytelling despite all the laugh track-induced demo-driven antics. That said, ever since about the middle of Season 2 the show's been more or less living down to its host network's reputation and rarely straying far from its main role as a delivery vehicle for childish physical comedy. So, what do you get when you combine the two? And more importantly, who would even ask that question in the first place? As it stands, Ultimate Spider-Man: Web Warrior's "Halloween Night at the Museum" barely makes any effort to address both questions in the slightest degree. For the latter question, the setup itself is convenient enough: Ultimate Spider-Man takes place in New York City. So does Jessie. "I smell crossover!" is no doubt what Joe Quesada and his Disney Channel counterpart instantly cooked up in their minds upon that realization. The storyline rationalization? The canon or continuity ramifications? The demo justification? You got me there. A major source for Jessie's charm (at least in the first season) was the remarkable and heartfelt humanity found in Jessie herself. As a teenage Texan essentially running away from her military home and a would-be college-bound or Army service life and trying to find herself in the Big Apple instead, the character had much of Debby Ryan's own autobiographical experiences and lessons poured into her early in the show's run. Following in the steps of Miley Cyrus' Miley Stewart/Hannah Montana and Hilary Duff's Lizzie McGuire, Jessie Prescott embodied all the light "girl power when convenient for commercialization" tropes present in most Disney Channel fare, but also fully embraced the tomboyish and even badass aspects of other recent leading lady characters like Selena Gomez's wizard Alex Russo and China Anne McClain's stubborn-to-a-fault Chyna Parks of A.N.T. Farm (which has its production legacy in the same Suite Life on Deck roots as Jessie). Jessie was more than capable of fending for herself in hand-to-hand combat thanks to the obsessive God Country and Nothing Else lifestyle and zeitgeist of her father; she learned to fly helicopters, clean, disassemble and operate an AK-47 and repair the treads of a tank (all the while in swimwear as per this universe's exaggerated conception of Texas teen beauty pageants). She was more than capable of expressing a soft and classically feminine side when she looked after her charges or pined for the romantic (Disney Channel code for overtly sexual) affections of her luxury apartment's doorboy, yet incapable of blinking twice at the thought of getting her hands dirty to defend the honor of herself or her loved ones. Most importantly of all, Jessie made mistakes. Frequently. And not the kind of "after school special" mistakes where characters make fundamental lifestyle flaws, feel sorry and make obligatory amends because the plot and/or a mandate from President Reagan himself says so, but the type of mistakes that quite frankly Jessie would be quite comfortable simply walking away from. The type of mistakes that might effect the popular standing of a kid at his or her school, or give a young child a miserable birthday, but have no true consequences for herself. Sure, she risks getting fired, but bailing from a miserable, unappreciative, thankless and even outright abusive entry-level low-wage job for whatever comes next can't exactly be the worst thing to happen to her. Yet it does matter to her, and she's willing to use her talents and put up with all the crap of her job to bend over backwards (literally) for everyone else's happiness. That is until the producers (which includes Ryan herself and long-time industry veteran Pamela Eells O'Connell, who brought to existence not only Suite Life of Zack and Cody and its follow-on Suite Life on Deck but a bevy of near-immortal sitcoms you've no doubt seen - Married...With Children, Mad About You and The Nanny from which Jessie serves as a tween spiritual successor to are all her creations) thought it better to double-down on pratfalls and corny one-liners at the extreme expense of characterization or plot. And thus how the storytelling and characterization of Jessie is now routinely outdone by shows with such compelling high concept titles as I Didn't Do It and Dog With a Blog, let alone the highly anticipated Girl Meets World (which brings back most of the creative staff of Boy Meets World with it). The creative staff have tried to add that human element back with the concluding story arc for the third season - and rather ineptly, with an out-of-left-field romance involving a charmless stalker (no, seriously - in the Disney Channel exaggerated-verse, Jessie's fiance uses CIA assets to cyber-stalk her. In the Disney Channel exaggerated-verse, this is considered so romantic Jessie has no choice but to accept his marriage proposal). Given Jessie's tendency to humor and write down to its intended demographic in its latest season, and given Ultimate Spider-Man's tendency for the same since practically its conception, it's only natural that the crossover episode between the two follow suit. If that were it's biggest sin, it would at least be excusable under the lens of tween entertainment - and yet it still manages to find fundamental ways to fail. Disney Channel is no stranger to crossovers - in fact, with practically each major series having one under its belt, you can even say it's the undisputed master. Starting with the Suite Life of Zack and Cody/That's So Raven/Hannah Montana crossover That's So Suite Life of Hannah Montana (which codified the Disney Channel Live Action Universe), the crossover event has become an anticipated and welcome spectacle of colliding worlds, characters and antics - and they're usually handled pretty well. Jessie's previous crossovers with Austin & Ally and Good Luck Charlie maintained each show's characterizations and handled the plots believably, as far as the continuity of the universe permitted, getting a lot of mileage from the fact that half an hour from each 1-hour to 90-minute crossover episode is handled by each crossing show's own creative staff. As far as "Halloween Night at the Museum" is concerned, the Jessie cast is little more than voiced props and special guest damsels in distress for Procacious Peter Parker to banter with in lieu of rescuing. You've no doubt noticed that I've waited this long to even get to the basic plot of the episode - believe me, you're not missing much. 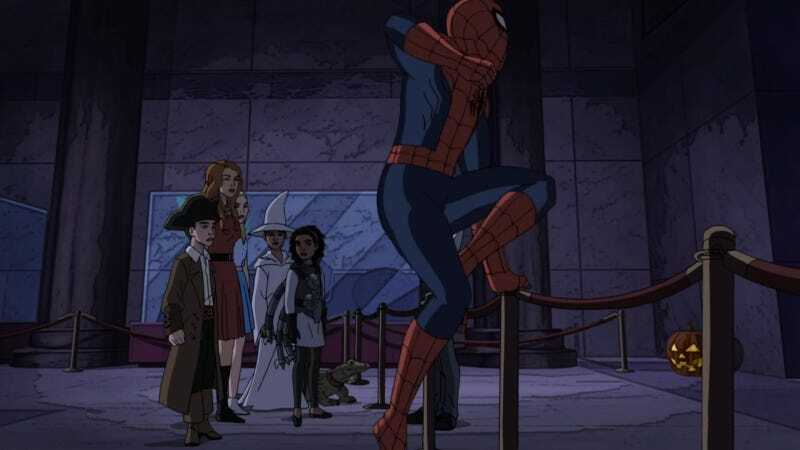 The excuse for the Jessie cast to cross paths with Spider-Man is that they need to visit a museum for a school assignment, and beleaguered Peter merely wants some high-minded rest after a near two-week marathon of busting bad guys. They both encounter a magical tomb inhabited by Morgan Le Faye of Arthurian legend and sealed with what's presumably Excalibur (the actual episode remains mum on that exact point); after knocking the sword from its perch, the kids are given magical powers corresponding to their costumes (Ravi becomes a sorcerer, Luke becomes a pirate - a nice nod to Cameron Boyce's starring voice work on Jake and the Neverland Pirates - Emma becomes a fairy and Zuri becomes, oddly enough, Spidey's own nemesis Doc Oc) while Morgan herself is unleashed. If you're not familiar with who any of those characters are and how to keep track of them, don't worry - other than being rescue bait the kids and their newfound powers do not actually factor into the plot whatsoever. Jessie herself has some limited badass moments swinging a sword wildly through the air with complete ineffectiveness, Morgan gets stomped on by a giant lizard-turned-dragon, Spider-Man pretty much saves the day single-handedly including placing the sword back in its proper place and magically restoring proper order, and the viewer walks away struggling to find a point to what he or she just witnessed. Debby Ryan does not look like that. No human alive looks like that. So if you're a big fan of seeing Debby's 52cs in apparent bra-free animated form (and who isn't?) then "Halloween Night at the Museum" is right up your alley. Otherwise, prepare to have all of your expectations horribly, atrociously realized. Image of Debby Ryan copyright Just Jared Jr., used under Fair Use. All other images copyright Disney XD/Disney Channel, used under Fair Use.